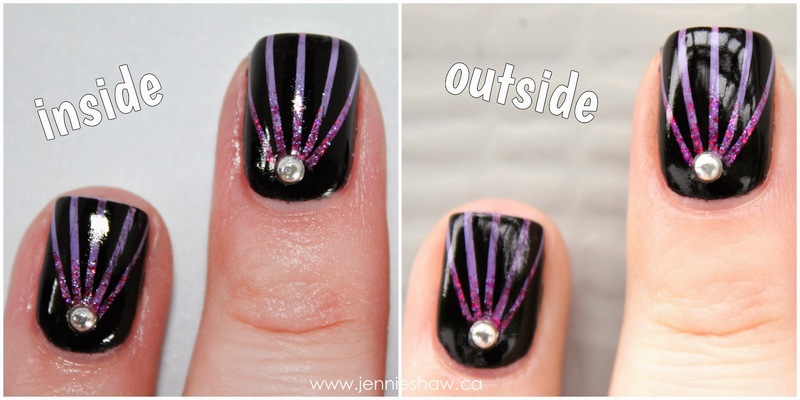 jennie's nails and tales: the nail files: best hot pink sparkles ever! I went shopping with my mum on Wednesday, and we stopped into Sally's to check out all of the holiday sparkles. And man oh man, are there ever some goodies this year! So, this week, I'm sharing a mani that was inspired by one of my latest purchases: the incredibly beautiful Explosion of Fun, which is from ORLY's Sparkle collection. You don't really get a good enough look at Explosion of Fun in that pic, so here's a WAY better one. Haha! To start, I did two coats of Black Expressionism on my pinky, pointer, and thumb, and two coats of Billie Jean on my middle and ring finger. When that was dry, I got to work on the gradient. With a triangular makeup sponge and painted three stripes of polish: Billie Jean, Tart-y for the Party, and Charged Up. Then, I sponged on two coats. After that was dry, I painted a thick stripe of Explosion of Fun onto the sponge, and dabbed it on the bottom almost-half. A coat of quick-dry top coat sealed it all in. Haha! Okay, I didn't actually cry. But I sure swore a lot! Anyway, when it was all said and done, the black nails were a tad plain, so I added a dot of Billie Jean, followed by a dot of Explosion of Fun, and VOILA! The mani was complete. Haha! Doesn't it look like...well...an explosion of fun coming out of the silver stud? Haha! So even though it totally smudged, I don't really care. The sparkles are to-freaking-die, and terribly hard to capture in a picture (I took no less than sixty, yes SIXTY, for this post). If, like me, you've been on the lookout for an amazing hot pink sparkle to add to your collection, you'll need to blow off work and get a bottle before they sell out. Have you found any incredible holiday sparkles that I should know about? Who's seen the new OPI Gwen collection? Is it as marvellous as it seems online? And don't forget to link up with your manis/reviews, as well as swing by Toria's blog for a Jamberry party! Woot woot for parties!! Happy weekend, everyone! Come on. Are you even serious with this? Amazing. AMAZING! Girl you keep bringing it! I'm jealous and now want to recreate this immediately. Girl!! These are STUNNING! Gorgeous! Love the design, and colors! Perfect! Great colors. I love pink, purple & black. Seriously, I'm not a big fan of hot pink, but I might have to swing by Sally and pick that up. All the sparkles!!! Good god you have patience and talent Ms. Shaw! What a vision, and what execution!! SMUDGES BE DAMNED, I CAN'T EVEN NOTICE THEM.